Every once in a while I am able to get my hands on a whole pork belly from my local pig farmer, without having purchased the whole animal. This may seem like a simple matter, but it is not. Our local restaurant chefs and artisanal (local/retail) charcutiers always get first dibs. 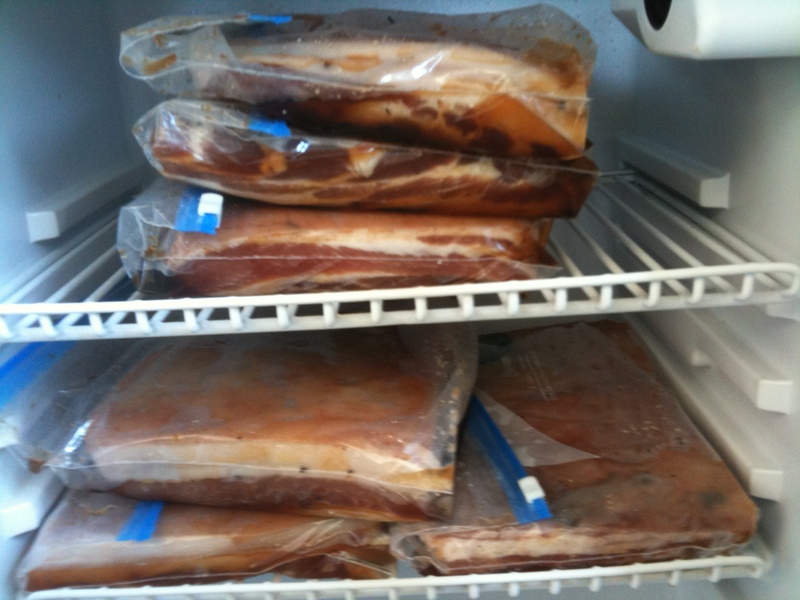 The short supply for us ordinary folks is also due to the fact that pork belly has become one of those “it” foods I have talked about before (here). The stuff is being roasted, braised, and sautéed. I’ve even seen it make an appearance breaded and deep fried. On many of the more modern or experimental restaurant menus, said pork belly is showing up increasingly more often and it is being used in a greater variety of ways: it’s not just your mother’s bacon anymore. In the summertime, when the tomatoes are at their best, we can go through a whole mess of bacon here. So, for my family, it takes a lot of fortitude to resist curing every last drop of fresh pork belly I am able to get my hands on. A fresh whole belly weighs about 17-20 pounds with the skin on. When all is said and done, you will probably yield about 65-70% of that weight as home cured, smoked bacon – maybe 12 pounds in all. 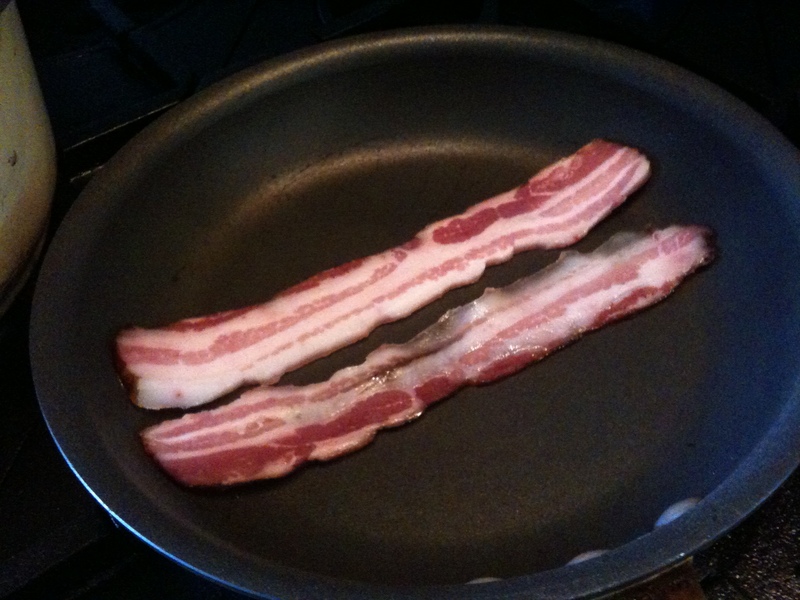 Bacon is easy to make, too – have a look here. This time, with this belly, I was ready to try making something other than bacon with at least a portion of the slab. By the time I recieved word from Colby Jones (Farrar Out Farms) that he had a whole fresh belly for me, I had chosen my strategy. I sliced off two (approximately) 1 1/2 pound chunks of meat and took off the skin with my great big chef’s knife. (I reserved and froze the skin. Eventually I will smoke it and use as seasoning for greens and other vegetables.) I made a brine using 6% salt and 3% superfine sugar. The superfine sugar dissolves very well in tepid water, as does the salt. Adding a touch of pink salt to the brine helped to maintain the pink color of the pork. To the brine I added two bay leaves, some fresh thyme, several whole garlic cloves, and some peppercorns. 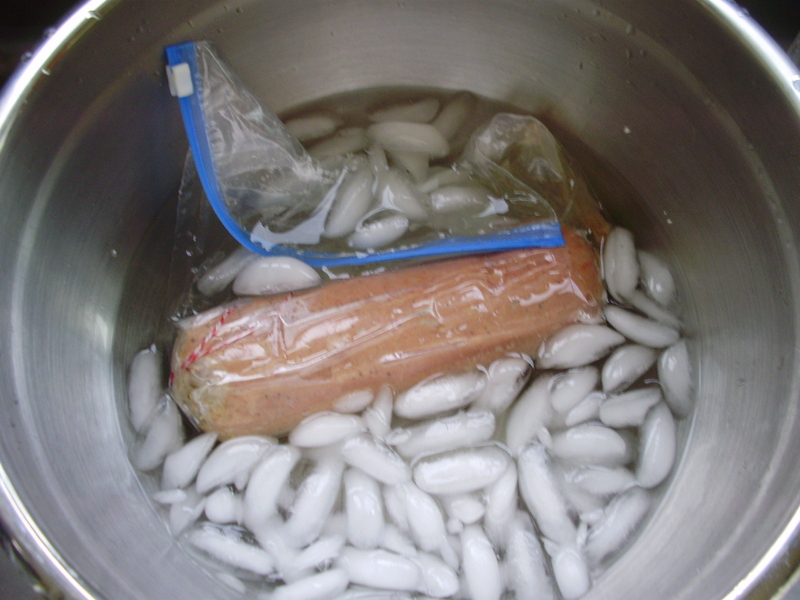 I made the brine directly in a jumbo zip lock bag and put the hunks of belly in the brine. This was left in the fridge for a day. 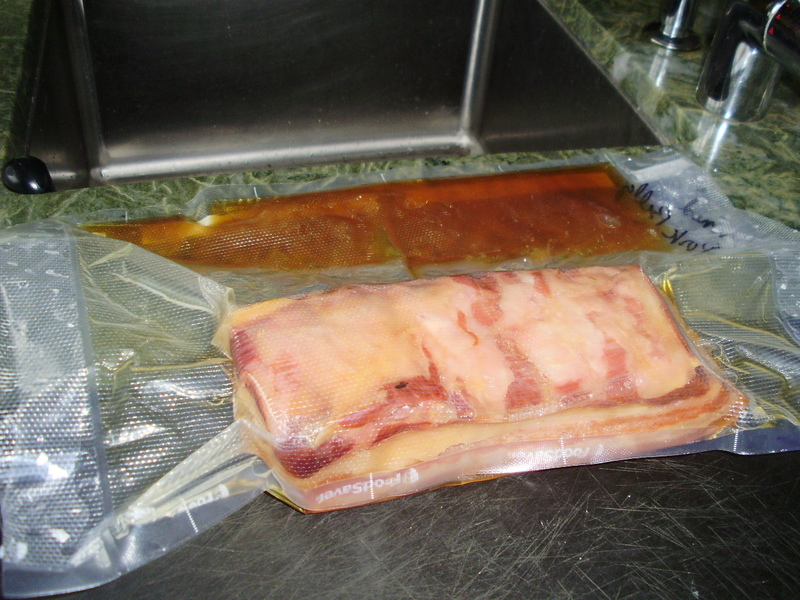 Once it was ready to be cooked, I took one chunk of the brined meat, dried it off and put it in a vacuum packing bag. I added a good half of a cup of local honey to the bag – enough to coat the meat, once the vacuum was applied. Now this is somewhat difficult to do with the Food Saver machine I have, since it is not the greatest with liquids. But there is a good trick that I use to make it work. 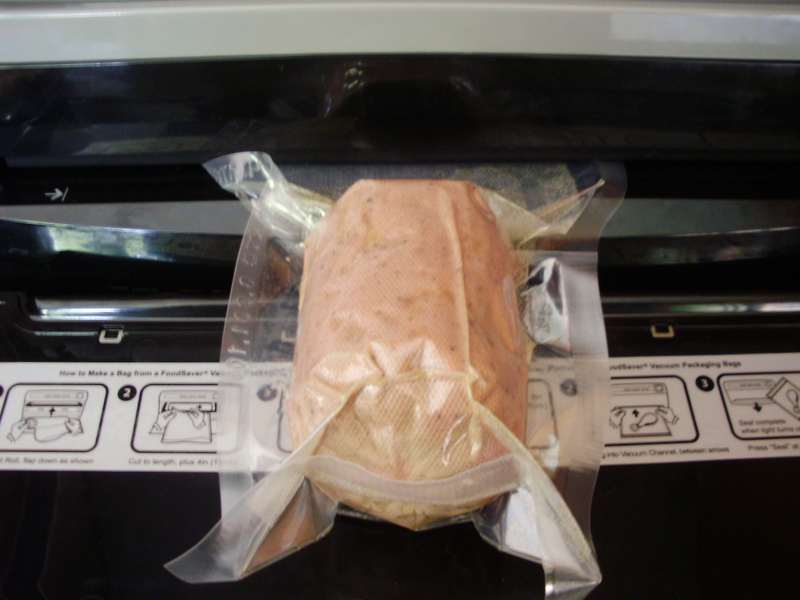 Use a bag that is large enough so that the meat and the liquid hangs about a foot or so over the edge of your counter after it is inserted into the mouth of the machine. This means that your bag will need to be about 18-20 inches long. With the help of gravity, the Food Saver will pull out the air and seal up the bag without sucking out the liquid or creating a faulty closure. The belly went into the Sous Vide Supreme water oven which was set at 79C/175F. I left it in the bath for 14 hours. When the time came, I took it out of the water oven and quick chilled it to stop the cooking. This is done with a large bowl filled with half ice and half water. Once the meat cooled down, I removed it from the bag, dried it off with paper towels, wrapped it tightly in plastic and popped it in the fridge. I reserved the sweet honey flavored pork juices for a sauce. The next day I took the belly out and brought it up to room temperature. 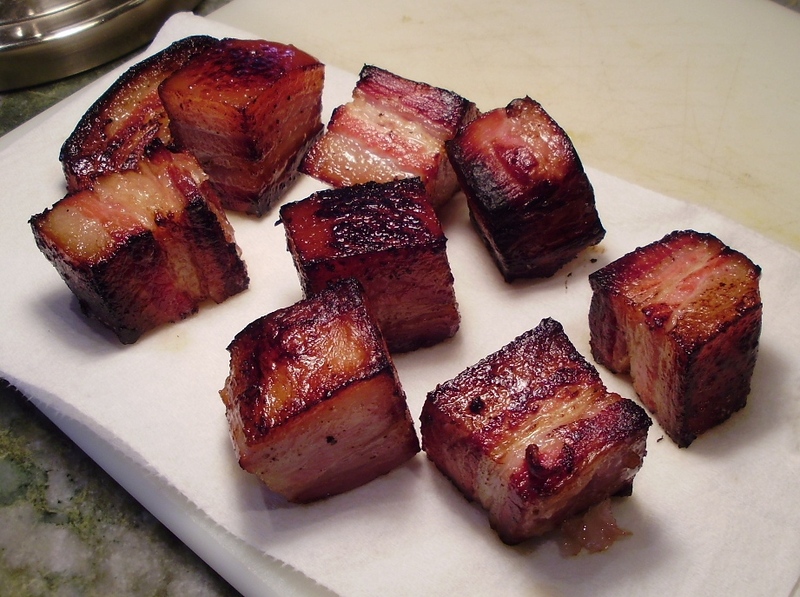 Just before it was time to sear and serve my fatty and hopefully delicious treat, I cut the belly into two inch cubes. Searing was no job for my good old Iwatani torch, however. Instead, I placed the meat into a very hot skillet. 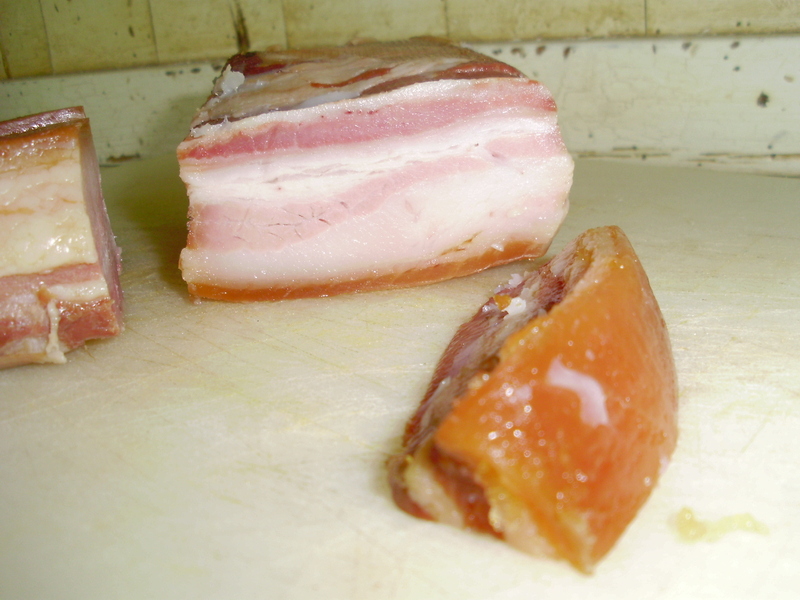 As each side of a cube of pork crisped and released, I turned it until all sides were very well caramelized. This took less than a minute per side and by the time all sides were crispy, the inside was nice and warm. I was able to make a wonderful sauce out of the juice that I had reserved from the bag. I took some apple juice (pure, organic and unsweetened) and reduced it by 50%. I added a couple of tablespoons of apple cider vinegar, some cloves and the stuff from the bag that was already highly concentrated with porky, honey flavor. Before thickening the mixture with a little cornstarch, I strained the liquid. My meal was now ready for plating. 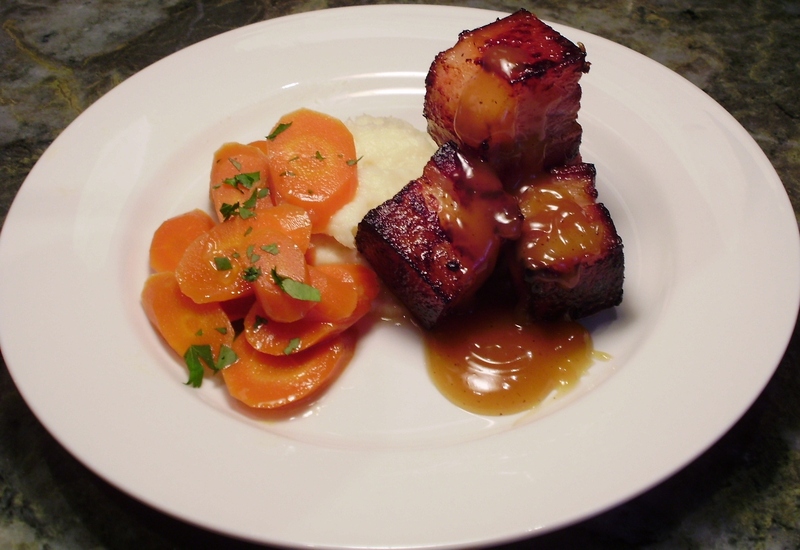 As sides, I served whipped parsnips and glazed sous vide carrots. This dish is a real keeper. I would happily serve this to guests. Because of the use of a relatively high temperature in the SVS, the fatty part of the belly was rendered well enough to leave just the right balance of both meat and fat. The pan searing process gave the chunks of belly exactly the right crispness and a perfect texture. The unctiousness of each bite was beautifully counter-balanced by the mildly sweet and sour, apple flavored sauce. No doubt, this is an incredibly rich and calorie filled meal that can’t be consumed too often without dire consequences to the waistline. However, as a special treat…well all I can say is “everything in moderation.” Actually, my husband’s enthusiastic “wow” said it all. I know people who don’t like chocolate, I know people who don’t like cake. I know people who don’t like tomatoes and I know people who don’t like steak. (Sounding a bit like Dr. Seuss here, I am!) These are things I cannot imagine disliking. Amazingly, I have met more than one of each. But I have never met anyone (vegetarians don’t count) who doesn’t like bacon. I am certain no matter what that if a carnivore exists who doesn’t like bacon, they are a unicorn. 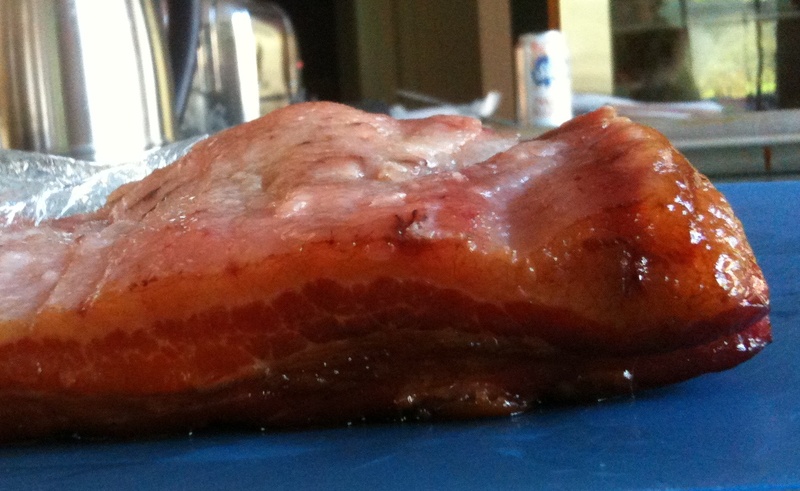 So bacon lovers, here’s the deal: if you have never eaten homemade bacon, do whatever you must to get some. It being homemade, you can’t buy it. That does not mean that you can’t buy incredibly great bacon but the bacon that is homemade defies description.You can’t imagine what you are missing. Happily, it is fairly easy to make, there are just a couple of little tricks. Trick one: you are going to have to get some “pink salt,” otherwise known as Instacure #1 or tinted curing mixture. (In Europe, they use saltpeter which is potassium nitrate.) Pink salt is a mix of plain salt (93.75%) with nitrate (6.25%). The reaction of nitrate with certain bacterias in meat, produce nitrite. Nitrate can be toxic if ingested in a large quantity. On the other hand, it is the nitrite that kills the bad bacteria and otherwise helps to transform the meat into the desired end product also contributing to the desired rosy color of the meats in which it is used. By mixing the nitrate with a ton of plain salt , it is diluted substantially so that you would have to eat an awful lot of just plain salt to get to a meaningful level of toxicity. Assuming you are not a complete dufus and you follow the simple instructions for combining your pink salt with your other ingredients which go into your bacon curing mixture (kosher salt, sugar, and herbs and/or spices of your liking), you really have absolutely nothing to worry about. 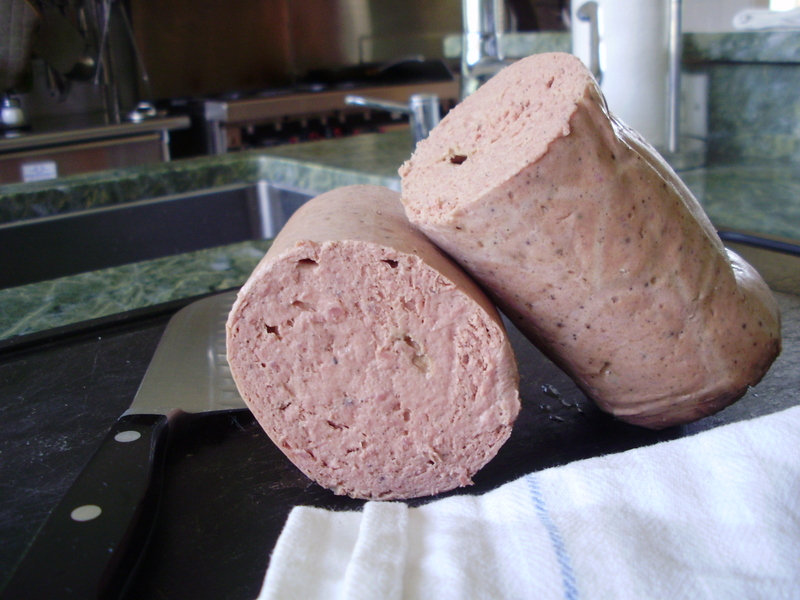 Nitrate and nitrite got a really bad rap in the 80’s and ever since then some people have been avoiding the stuff. It was believed that in large enough quantities, the chemicals might cause cancer. But according to Harold McGee, the guru of food chemistry, if you don’t eat a huge bunch of food with these chemicals in it, you really don’t need to be concerned. The amount that you are going to use for your bacon really is miniscule especially compared to the size of the risk you are significantly minimizing with its use. That risk, the one you are minimizing, is botulism and you don’t want it (unless, in the form of Botox, you have it injected in the right places by your qualified medical professional). But you do want homemade bacon, so just get over your concern about the pink salt. Everything in moderation. Trick two: You have to obtain some pork belly. The higher quality you get, the better. Get thee to your sustainable, local farmer and order some. How do you find your farmer? There are plenty of ways, but one is to go to www.slowfoodusa.org and follow the links through to your local chapter’s web site. There you should find a list of farmers’ markets and possibly even some links to specific purveyors of good pork in your area. Of course, you can just do an internet search and you should come up with other resources as well – here is a great site to check. You can even order some over the internet from various gourmet purveyors. (For example, Food52 has a New York resource through its online store.) Here in the St. Louis area we have Prairie Grass Farm, Farrar Out Farm, Greenwood Farms and Hinkebein Hills, among others. If you can Red Wattle Belly or other heritage breed type pig meat, this is even better. Trick three: If, like me, you prefer your bacon smoked, you have to find a place and a way to do this. A barbeque grill will work – just know that you have to keep stoking the smoke for a couple of hours until the bacon gets up to temperature. You will want to heat up the grill, get some wood chips smouldering with the coals or heat source being only beneath the wood or otherwise indirect, and put that cured belly on the grill. If you want, you can buy a cheap smoking gizmo to set in your grill at most hardware stores and this time of year you can even buy the smoking wood there. Choose the flavor of wood chips that most please you. I prefer a mix of applewood and hickory. Hickory is very strong and applewood is sweet. If you have a line of any other fruit woods, go for it! Soak some of the wood in very hot water for at least an hour before you put it over the fire. Add back some dry chips to get the smoke going and go to town. Leave the meat on the covered grill until the belly reaches an internal temperature of 150F. Once the belly has been refrigerated and is thoroughly cold, it becomes easy to slice. 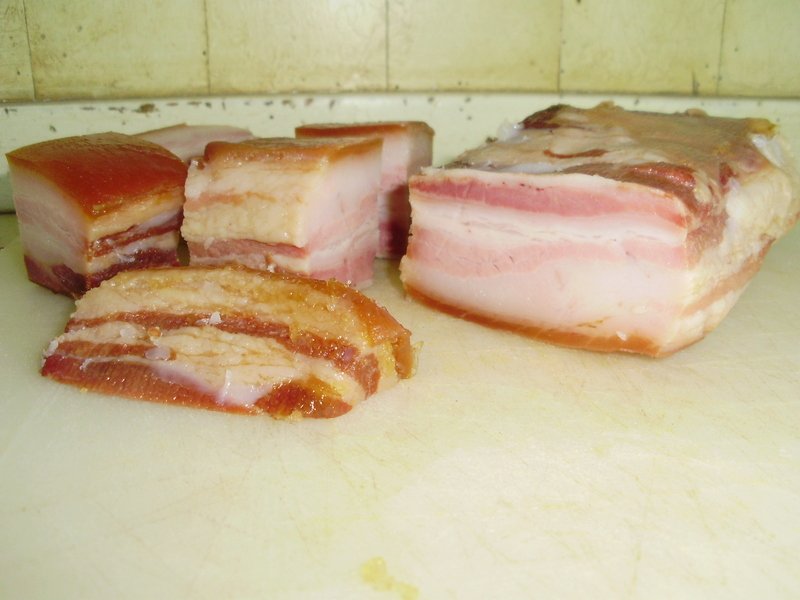 Hand sliced bacon is rustic and likely to be thicker than the store bought stuff. But, if you are like me and you put tons of sugar in your cure, the thick cooked bacon will have a fantastic chewiness to it. OMG TDF! It will keep in your fridge for a good long time – up to a couple of weeks if you keep your fridge nice and cold (I keep mine at 34-36F). Mostly what I do, however, is slice it and package it up in serving sized freezer packages. It is really important to use a scale for these ingredients and it is best if you can do it in grams, for greatest accuracy. Salts and sugars vary in volume substantially. If they were smushed in the course of getting to your pantry, the crystals are broken, etc., etc. You get it, right? Mix these ingredients together very well so that the pink salt is thoroughly distributed throughout. This will take care of about 5 pounds of pork belly. Now is the creative part: figure out what you want to season your bacon with. I use a palm full of juniper berries and a teaspoon of so of black pepper corns which I crack with a rolling-pin. I also toss in a sprig or 4 of thyme per chunk of bacon. After I have thoroughly coated the meat in the basic cure and sprinkled on the seasonings, I top it off with a generous sprinkling of brown sugar on top. Other possibilities include pouring a mess of maple (instead of brown) sugar on top, leaving out the sugar completely and using lots of herbs or tons of cracked pepper. I have even heard of people using Jack Daniels (yuck). All this gets put into ziplock bags (one piece of meat per bag), closed up and put in the fridge for about a week. Each day I turn the bags to redistribute what will become a liquid in the bag. Now I’m going to tell you this: there are many different ways of doing this and I myself have tried it a number of those ways. For me, this is the easiest, most effective and thus my favorite. I have never gotten bacon that was too salty this way. Nonetheless, I invite experimentation! Because of the high sugar content of my bacon, when it cooks it caramelizes beautifully giving the finished product a texture that can’t be matched. The sugars come to the surface and out into the bacon grease so you have to be a little careful with your heat – fry the bacon a little more slowly than you might the store-bought stuff. 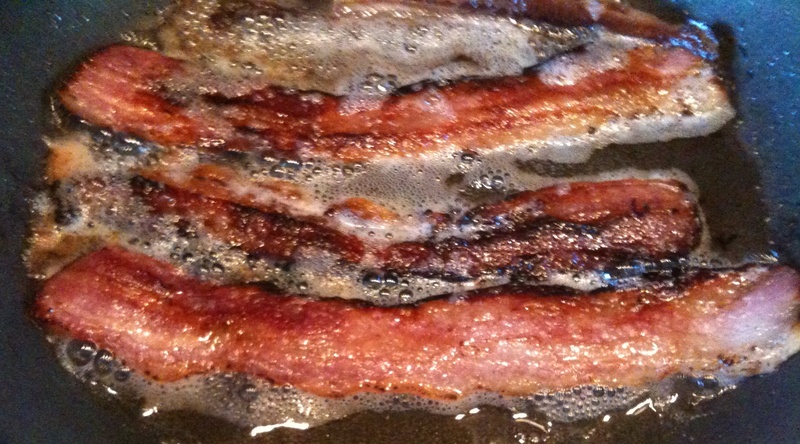 Another thing is that homemade bacon does not have a lot of water in it. It will render more evenly and quickly as a result. But, the most striking thing is that it tastes so much more heavenly. Can’t you just smell it?